All this spring and early summer feasting leads to rapid weight gain, but also a sodium deficiency. Green plants are low in sodium and high in potassium. 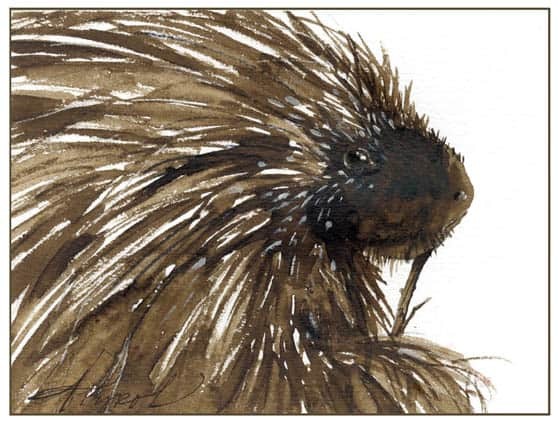 According to Uldis Roze, author of “The North American Porcupine,” porcupines and other herbivores need both sodium and potassium to activate nerves and muscles, but must maintain a 1:1 ratio of these two ions. If the amount of potassium significantly exceeds the amount of sodium, the animal can die. Plants contain potassium to sodium ratios as high as 500:1. So porcupines feeding on green vegetation must excrete excess potassium and seek out salt. For the same reason, other herbivores like moose and snowshoe hare often congregate at roadsides in spring to feed on salt left over from the winter. Roze discovered that porcupines preferred the wooden pegs with the highest concentrations of sodium. When he added potassium, they chose pegs with the most balanced sodium to potassium ratios. In his study, females came to the cabin in search of salt more often than males. He attributed this to hormones associated with pregnancy and lactation, which prompt a craving for salt; nursing mothers lose sodium in their milk. Roze observed the rate of salt-feeding by his porcupines peak in May and June, with a second minor peak in August and September, when they were feeding on large numbers of apples. Apples are acidic, impairing sodium resorption in the kidney and causing the animals to lose sodium in their urine. The salt drive dissipates in winter, when the animals are less mobile and get by on sodium that’s stored in their caecum. Susan Shea is a naturalist, conservationist, and freelance writer who lives in Brookfield, Vt. The illustration for this column was drawn by Adelaide Tyrol. The Outside Story is assigned and edited by Northern Woodlands magazine, and sponsored by the Wellborn Ecology Fund of New Hampshire Charitable Foundation: wellborn@nhcf.org.